This post was inspired by a girl who had Chick-fil-a for lunch today, so you have her to thank. This girl, who looked around 20-25 years old, wearing an I.D. which means she has a profession of some sort, was normal looking, and was sitting with a boy who seemed to have taken a special trip from where he was to meet her for lunch. What on might, however naively, expect is a cordial, pleasant interaction between the two. What I saw was something different. I saw her food first. The masticated piece of chicken sandwich waiting to be swallowed appeared again and again…and it spoke to me. It said SMACK SMACK SMACK. Gulp. Soo…at the risk of sounding like an old fart, but unashamed nonetheless, I propose to you the following list of essential manners. This is a little bit unnatural, so you’ll have to practice if you aren’t already in the habit. Also, this manner won’t be recognized or lauded by anybody–so don’t wait around for congratulations or praise. On the other hand, the lack of this manner is noticed by EVERYONE. Grodie. 2. Elbows off the table. It’s just the rule. Trust me. 4. Hold doors for people coming in/leaving when you’re at the door. Moving away from the dinner table, this rule used to be applied only for men holding doors for women. A lot of women decided that it was degrading. That is stupid, but even stupider is to disregard a societal nicety to prove a point about how to treat people. The better direction is to make the rule universal. Hold the door for whomever is coming. I am teaching my sons to hold the door for women. Why? Because I am teaching them to respect women. So sue me. 5. Get out of the way. 6. Talk to people…and be nice. Speaking to people is quickly becoming a lost art. I don’t mean that you have to strike up a deep, meaningful conversation out of thin air with a complete stranger, but it simply makes things nicer when you say “Hi” or “Good Morning” or even “Excuse me.” Try making eye contact while your at it. Men especially here: if you see a lady reaching for a product at the store or scrambling to pick up the blueberries her child just dropped all over–go over and help. This takes courage, as strange as that may seem. But it takes much more courage to help a woman who is being mugged, and if you have no previous practice, I doubt you will be of much use in the latter situation. Alright, this is one of my biggest faults. Stop doing what you’re doing and don’t simply be ready to say what you are going to say next. Listen to someone who is talking to you. This is one of the kindest, most respectful gestures you can offer. These rules apply mostly in a traditional American culture. I don’t, and you shouldn’t, expect all people from all cultures to maintain the same actions and expectations that belong to this list. That being said, I would love to hear the manners that are nearest and dearest to you and your family. Or maybe you hate this post–feel free to say so. 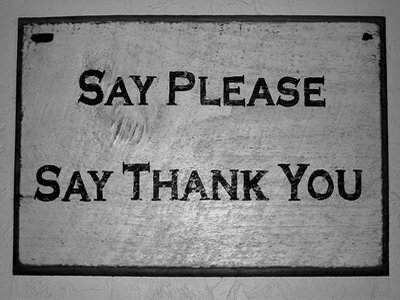 Saying “please” & “thank you”. My boys learned that just because I always said it to them. In other words not that hard to learn/teach. My kids and I were reading today about Jesus washing his disciples’ feet and we talked about being a servant. To me, manners is about serving others–putting others ahead of yourself. I’m in agreement on the eye-contact thing. I have seven kids and somewhere along the way I realized I was so distracted by my kiddos that I was barely making eye-contact with anyone anymore. I realized this when all the cashiers at Walmart remembered me and I had never even looked up! Now I work on looking at people and remembering things about them. One of my pet peeves, manners-wise, is not apologizing for something that is an accident, like bumping into someone. My family has the bad habit of “I didn’t mean to!” instead of “I’m sorry, are you okay?” My other pet peeve is a big strong man walking right by a pregnant woman loading heavy packages in her car. I can’t tell you how many times this has happened to me–grr! Please and thank you- excellent points. It’s funny to me that so many adults think those words are more for kids. And Tanya- apologizing for accidents- of course! Do you think that society’s concern for liability has squashed that ability? David – Emily Post would be proud. here are a few others. 1) If you are a man riding on public transportation or sitting in a waiting room and you see a woman or an senior come looking for a seat — GET UP AND OFFER YOUR SEAT. I can’t stand it when men are sitting playing on their cell phones totally oblivious to the fact that an 80 year old grandmother just walked in. 2) Use “sir” or “ma’am” when speaking. I’ll admit, this was something I didn’t do until moving to TX. 3) When waiting for an elevator, men should allow ladies to enter / exit first. Hold the door while you’re at it. 4) When you use the last __, replace it.